Back in July 2016 I was proud to highlight the issue of living medical donations from people while working, see the previous post. “Living medical donors (e.g. 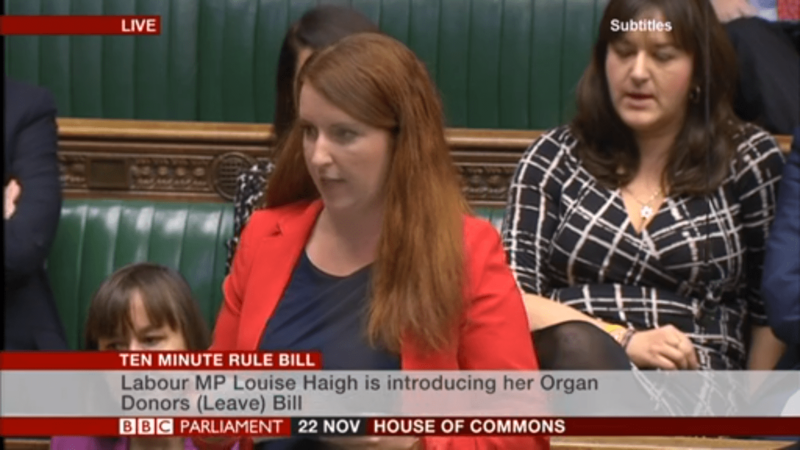 kidney) should be eligible for statutory sick pay” and in addition to this Louise Haigh MP for Sheffield, Heeley raised a Ten Minute Rule Motion for Organ Donors (Leave) which today was read in the House of Commons. The speech highlighted the amazing work which is going in to promoting donations after death but with donor levels so low we should do everything we can to support living donors. We are already chronically short of donors and we should be breaking down every conceivable barrier put in the way of these potential life savers. Recovery time can often be long for living organ donors and they should be able to concentrate on getting back to normal, not rush back to work because they are unable to afford the time off or fearful that their job may be at risk. Young people, in particular, will be fearful that if they take as much as the recommended 12 weeks off work, they may be disadvantaged and this will put off many of the most healthy from becoming a living organ donor. My Bill will send a clear signal that if you are prepared to give an organ to save a life, the law will back you up every step of the way. You can find the full text here. Following unanimous support the bill will go to a second reading on 20th January.